Qatar, which enjoys an advanced position in the Global Competitiveness Report of the World Economic Forum, witnessed a robust 16% growth in merchandise trade and 18% in exports last year, according to a top government official. 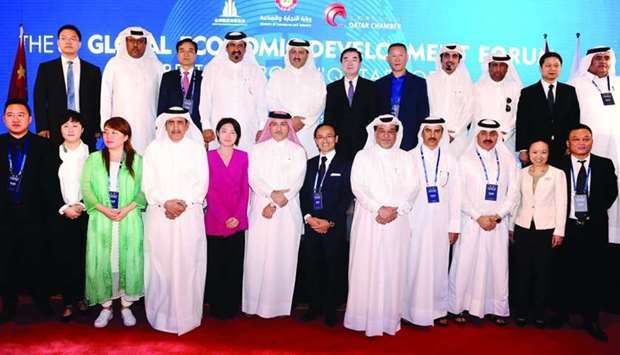 Addressing the sixth Global Economic Development Forum (GEDF), organised by the Ministry of Commerce and Industry (MCI) in association with the Qatar Chamber and China-based GEDF, Sultan bin Rashid al-Khater, undersecretary at MCI, said Qatar’s economy (at constant prices) grew 1.6% during 2017. Quoting a report of the World Bank, he said the Bretton Wood’s institution expects Qatar’s economy to grow 2.8% in 2018, and achieve an average growth of around 3% in 2019-20, with the country going to fully support foreign investment. The business and investment environment in Doha offers great facilities and advantages to foreign companies operating in the country, he said. Qatar is one of the most important countries to stimulate investment due to its strategic location in the region and attractive policy for foreign investments as well as benefits such as flexible and sophisticated business environment based on laws that allow ownership of up to 100% in various fields, he added. During the forum, al-Khater attended the signing of four memoranda of understanding including an MoU on Cambridge International School between Taleb Group and Hong Kong Sino-Austria Group. A second pact on digital finance was signed between Taleb Group and You Kongpai Blockchain, a third MoU on international trade between Taleb Group and Tongtian International Group and a fourth on trading platform between Taleb Group and Yangyang Trading Company. Market believes that Qatar’s moves to allow 100% foreign capital in all the sectors is “positive”, especially in the banking sector, and is expected to further enhance the country’s position in the global foreign direct investment landscape. The legislative framework regulating foreign investments in Qatar offers foreign investors the opportunity to own up to 100% of investment projects in various sectors, HE the Minister of Economy Sheikh Ahmed bin Jassim bin Mohamed al-Thani had recently told a business delegation in the US. In May this year, the Cabinet had taken up a draft law which stipulates that non-Qatari investors “may invest in all economic sectors up to 100% of the capital, and may own no more than 49% of the share capital of Qatari listed companies on the Qatar Stock Exchange”, after necessary approvals are received from the competent authorities. HE the Prime Minister Sheikh Abdullah bin Nasser bin Khalifa al-Thani had recently asked fraternal and friendly countries to take advantage of the “distinctive” business opportunities Doha offers across sectors, especially in the industrial, agricultural, IT, education, and health.